The Loss of Identity: Who Is Israel? Needless to say, the identity of Israel in the modern evangelical world is a subject of endless discussion. The Zionist / Dispensationalists tell us that there is really no debate, the nation calling itself Israel, in the land of Palestine, is in fact the covenant people of God. Not only that, they must, absolutely must, be supported by America, or we as a nation risk incurring God’s wrath as John Hagee and other noted (infamously false teachers) remind us constantly. The truth is that it is a very legitimate study to ask the question, is the nation of Israel as it exists today actually descended from Abraham, by blood, and, should America and the rest of the world support her right to the land called “Israel” regardless of anything. Now, let me say this: everyone has a “right” to live somewhere, regardless of their national identity. It is simply wrong to say that a person, because of their ostensible lineage, has no right to live anywhere– or to even live! With that said, however, to acknowledge that everyone has a right to live somewhere is not the same as saying that a given people are God’s covenant people and that a given piece of real estate is their’s by divine right! Those are separate issues. The issue of whether the people called “Israel” today is genuinely racially related to Abraham is one that is hotly debated. This continues to be debated based on DNA studies, a field far beyond my expertise, and totally unrelated to what I want to share here. While I am unqualified to address the issue of DNA, it should be noted that several studies have concluded that modern “Israel” is not, in fact, descended from the physical lineage of Abraham. Those studies, needless to say, have come under severe attack by the “pro-Israel” camp, that claims that the counter studies are “anti-semitic” and even promote Nazism! In spite of that controversy, which, needless to say, is sometimes extremely emotionally based, I think it is more than worthwhile to take note of what anthropologists and even what the “Jews” of the day say about the issue. I will give here only a few citations, because this information is not the point of this discussion. Nonetheless, I think it important to offer just a small sampling of evidence for the reader to consider. “It is a common assumption, and one that sometimes seems ineradicable even in the face ofevidence to the contrary, that the Jews of today constitute a race, a homogeneous entity easilyrecognizable. From the preceding discussion of the origin and early history of the Jews, it shouldbe clear that in the course of their formation as a people and a nation they had already assimilated a variety of racial strains from people moving into the general area they occupied. This had taken place by interbreeding and then by conversion to Judaism of a considerable number of communities. With this scientific evidence to consider, what I want to is to examine what identified a Jew / Israelite, in the ancient world. In light of the above, let it be noted that for my purposes, I am not denying the existence of a group of people that had – in the first century – some connection, some racial, blood line connection to Abraham. There were genealogies in the Temple that established that, and that is how the identity of Jesus as Messiah could be fully established beyond disputation. However, with the catastrophic destruction of the Temple in AD 70, those genealogical tablets– the only way of proving a physical connection to Abraham – were destroyed! The significance of this can hardly be over-emphasized, and yet, many people today simply ignore it. With these preliminaries before us. We will begin our investigation. 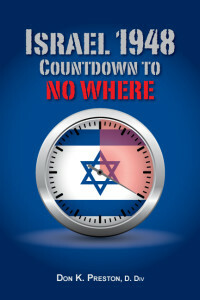 In the meantime, be sure to get a copy of my book, Israel 1948: Countdown to No Where. It may well open your eyes! It has literally changed the lives of countless Bible students! This book is a stunning refutation of modern Zionism and Dispensationalism! Powerful!